There are some outside the Republican camp who want to believe that Rand Paul may be a little bit of fresh air from a party that is considered to be either stodgy or extreme. With his father, Ron, being the best known Libertarian in the United States, Rand is seen by some as a respecter and protector of individual liberties. But do not be confused: The rights that he wants to protect are those of the gun owner who wants to carry weapons most anywhere. He also favors the rights of the business owner who wants to withhold his goods and services from people he doesn’t like, such as LGBTs. He certainly is nowhere close to championing the rights of women to control their reproductive decisions, or helping the poor with programs to redistribute income. Rand Paul did something that no other Republican did; he came to Ferguson, Missouri, scene of the August 9, 2014 shooting of unarmed Michael Brown by Officer Darren Wilson and the subsequent protests and riots. Paul did more than gawk; he met with protestors and actually tried to listen to their grievances. The first policy proposal Rand Paul announced in his big speech declaring his presidential campaign this week was an old-fashioned plan for the federal budget. The Republican senator from Kentucky wants to amend the Constitution to require a balanced federal budget every year. It’s an old saw. For decades, Congressional Republicans have been carping for a balance budget. They were obviously absent the day that the British economist John Maynard Keynes explained to Franklin Roosevelt and all Americans that a balanced budget can often stifle the growth needed to jump-start a lagging economy. Keynes’ contention was rather straightforward: The federal government has the power to borrow money when necessary, and it should use that power to fund programs to help the unemployed and the poor. As these people get back to work, they will pay taxes that can re-balance the budget. Some eighty years later, we have learned that even if we are not able to rebalance the budget in the short-run, we are none the worse for wear. What Franklin Roosevelt and a Democratic Congress did during the New Deal was to borrow to create a variety of agencies that provided job opportunities as well as an economic safety net, namely Social Security. Granted, the big spike in employment did not occur until the U.S. entered World War II, but the mechanism was in place to have government take action that gave a higher priority to helping people, rather than balancing a budget. Maybe some military spending, because he had previously hinted that he thought this was a good idea, but after he had a big rally in the shadow of a huge aircraft carrier, it seems that military cuts are off the table. Cutting spending on consumer safety. Just this one position by Rand Paul, his support for a balanced budget amendment, show us that he has the mean streak of so many other Republicans and has a callous disregard for people with real needs, particularly economic needs. Don’t let that edgy part of Rand Paul fool you. Yes, he’s a little bit “anti-establishment,” as most free-thinking people would be. 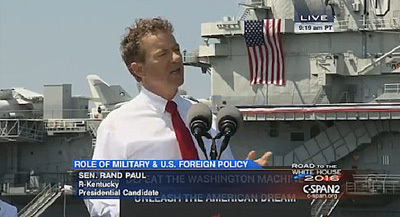 Yes, he has expressed greater reservations about going to war than most other politicians. But when you get down to the particulars of his ideas, he is just another Republican tightwad who holds hostage the needs of the hundreds of millions of Americans who are either poor or in the stagnant middle class. If you want “change you can believe in,” cross him off your list.